The central panel depicts a prince on his stallion and the wounded lion. The dark blue border is decorated with wild boars, rabbits, wild geese and a hawk. A lion leaps at each top corner. The rich reds and old golds contrast beautifully with soft greens and blues. 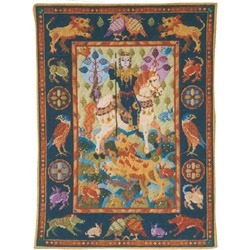 The kit uses Anchor tapestry wool on 10hpi canvas and measures 20" x 27" (51.3 x 69cm) suitable for a wallhanging. Contents: Canvas, wool, black and white symbol chart, full illustrated instructions and two needles.